This bilingual pictorial word book follows a family from morning to evening as it introduces words and a few sentences. The book starts as the morning starts. Readers see a cross section of a house, with various locales and objects labeled in both English and Spanish. As the children get dressed, words related to clothing are presented. Bit by bit, other activities occur and become the basis for more vocabulary: food, city sites, professions, the library, the market, games, feelings, vehicles, weather. Eventually the day winds down, and the children go to bed: “¡Felices sueños! / … / Night night! Sleep tight!” The illustrations include people, clothing, food, and housing from different cultures (alas, this book replicates the common misstep of housing indigenous Arctic peoples in an igloo and American Indians in a tepee). Readers see women in jobs such as a construction worker, a farmer, and an astronaut; and characters using a wheelchair, crutches, or wearing an eye patch. All of this adds up to an inclusive, mostly real worldview. 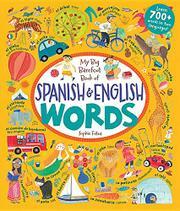 The book is best suited for readers familiar with both English and Spanish who are searching for particular vocabulary words. This familiarity is needed, as there is no pronunciation guide. It is not a language-learning tool as, except for some adjectives related to feelings, only nouns are presented. Readers also need to be aware that some flexibility is necessary, as not all words are universally used throughout the Spanish-speaking world.